Invaluable information expertise in challenging situations. Help with the “heavy lifting” of producing a filing and responding to data requests. Efficiently producing a filing and handling an influx of data requests requires an established process and technology to coordinate the participants and information. The process should include steps, owners, timeframes, and deliverables. It should be supported by a lean, but effective database application that houses the data requests and responses, allows for tracking through to completion, and supports reporting on progress and results. Celerity will work with your IT group to understand the feasibility of utilizing in-house tools. Where there are gaps, Celerity can provide a secure online solution, Oliver Regulatory Request Manager. Celerity can provide a dedicated team to manage the logistics of the data request process, from receipt to response. Celerity logs each data request at the filing and question level and tracks the scope through to completion. The team provides timely status reports, showing data points, such as average response time and on-time response percentage by agency or group. These insights help identify bottlenecks or resource constraints so adjustments can be made. Celerity adheres to Project Management Professional (PMP) principles as established by the Project Management Institute. The majority of our project management team is PMP-certified or in training to sit for this credential. The results are clear in our well-run projects that are on time and on budget. A full spectrum of support services. 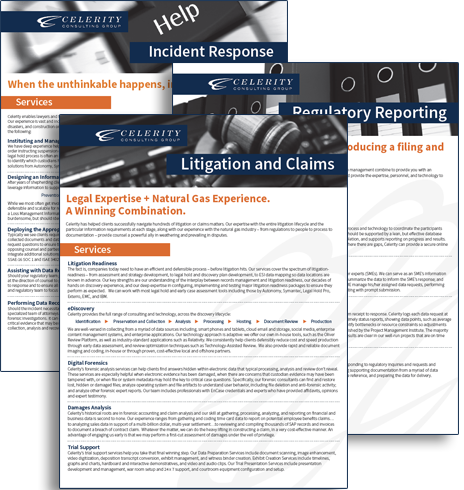 Celerity has helped clients successfully navigate hundreds of litigation or claims matters. Our expertise with the entire litigation lifecycle and the particular information requirements at each stage, along with our experience with the natural gas industry – from regulations to people to process to documentation – provide counsel a powerful ally in weathering and prevailing in disputes. The fact is, companies today need to have an efficient and defensible process – before litigation hits. Our services cover the spectrum of litigation-readiness – from assessment and strategy development, to legal hold and discovery plan development, to ESI data mapping so data locations are known in advance. Our key strengths are our understanding of the interplay between records management and litigation readiness, our decades of hands on discovery experience, and our deep expertise in configuring, implementing and testing major litigation readiness packages to ensure they perform as expected. We can work with most legal hold and early case assessment tools including those by Autonomy, Symantec, Legal Hold Pro, Exterro, EMC, and IBM. We are well-versed in collecting from a myriad of data sources including, smart phones and tablets, cloud email and storage, social media, enterprise content management systems, and enterprise applications. Our technology approach is adaptive: we offer our own in-house tools, such as the Oliver Review Platform, as well as industry-standard applications such as Relativity. We consistently help clients defensibly reduce cost and speed production through early data assessment, and review optimization techniques such as Technology-Assisted Review. We also provide rapid and reliable document imaging and coding, in-house or through proven, cost-effective local and offshore partners. Celerity’s forensic analysis services can help clients find answers hidden within electronic data that typical processing, analysis and review don’t reveal. These services are especially helpful when electronic evidence has been damaged, when there are concerns that custodian evidence may have been tampered with, or when file or system metadata may hold the key to critical case questions. Specifically, our forensic consultants can find and restore lost, hidden or damaged files; analyze operating system and file artifacts to understand user behavior, including file deletion and anti-forensic activity; and analyze other forensic expert reports. Our team includes professionals with EnCase credentials and experts who have provided affidavits, opinions and expert testimony. Celerity’s historical roots are in forensic accounting and claim analysis and our skill at gathering, processing, analyzing, and reporting on financial and business data is second to none. Our experience ranges from gathering and coding time card data to report on potential employee benefits claims…to analyzing sales data in support of a multi-billion dollar, multi-year settlement…to reviewing and compiling thousands of SAP records and invoices to document a breach of contract claim. Whatever the matter, we can do the heavy lifting in constructing a claim, in a very cost-effective manner. An advantage of engaging us early is that we may perform a first-cut assessment of damages under the veil of privilege. Celerity’s trial support services help you take that final winning step. Our Data Preparation Services include document scanning, image enhancement, video digitization, deposition transcript conversion, exhibit management, and witness binder creation. Exhibit Creation Services include timelines, graphs and charts, hardboard and interactive demonstratives, and video and audio clips. Our Trial Presentation Services include presentation development and management, war room setup and 24 x 7 support, and courtroom equipment configuration and setup. Celerity provides cost-effective support of the claims management process, including analytical services to help quantify potential claims or to audit submitted claims; a team to field, research, and resolve the claims; information management tools to ensure a defensible and efficient process; consulting to design and manage the workflow; and project management to ensure progress and report on results. When the unthinkable happens, information is king. Our team has assisted on several of the highest-profile events in the nation in the last few years. Our reach is national and our team can be mobilized quickly. Contact us to see how we can help your company or client respond effectively to an accident, incident, or significant event.